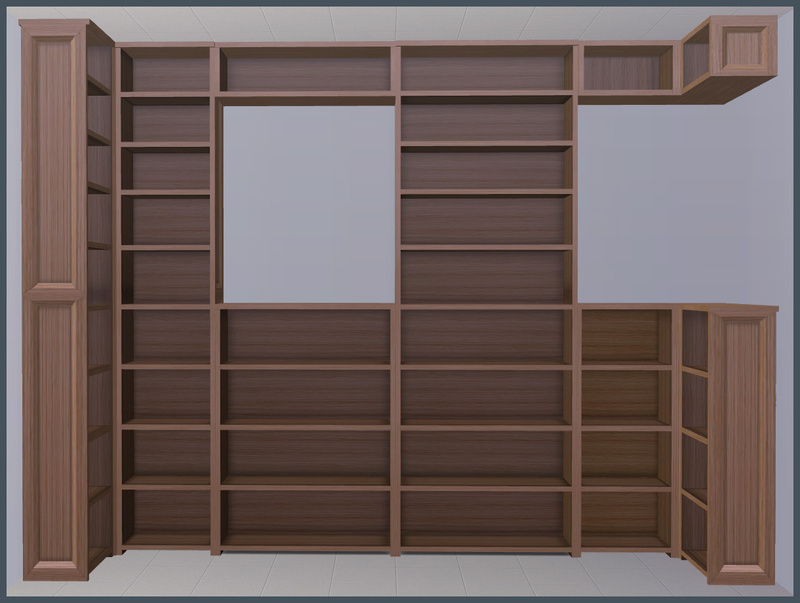 So this is what you get - 6 modular pieces, 4 of which are fully functional bookcases - if you leave them empty books appear from nowhere.... The two small bits are purely decorative and have NO bookcase functions. They have slots though. 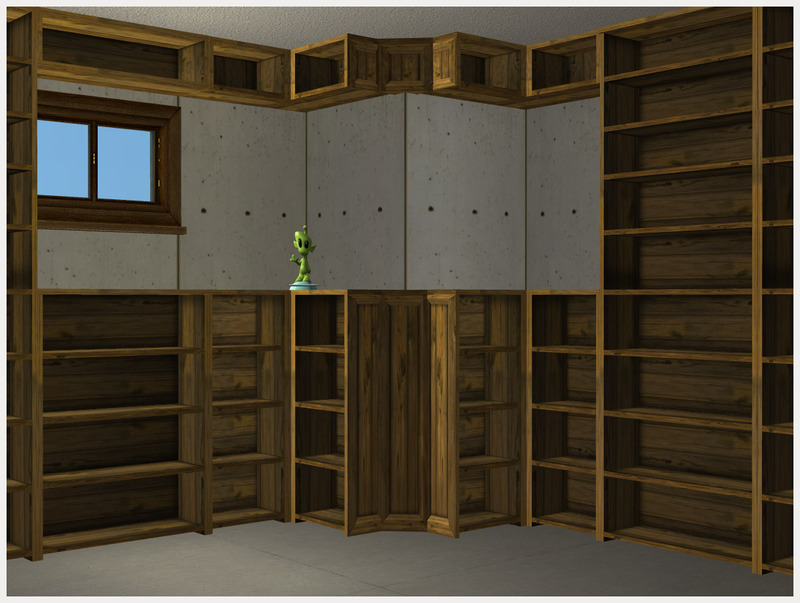 And slots - need books. 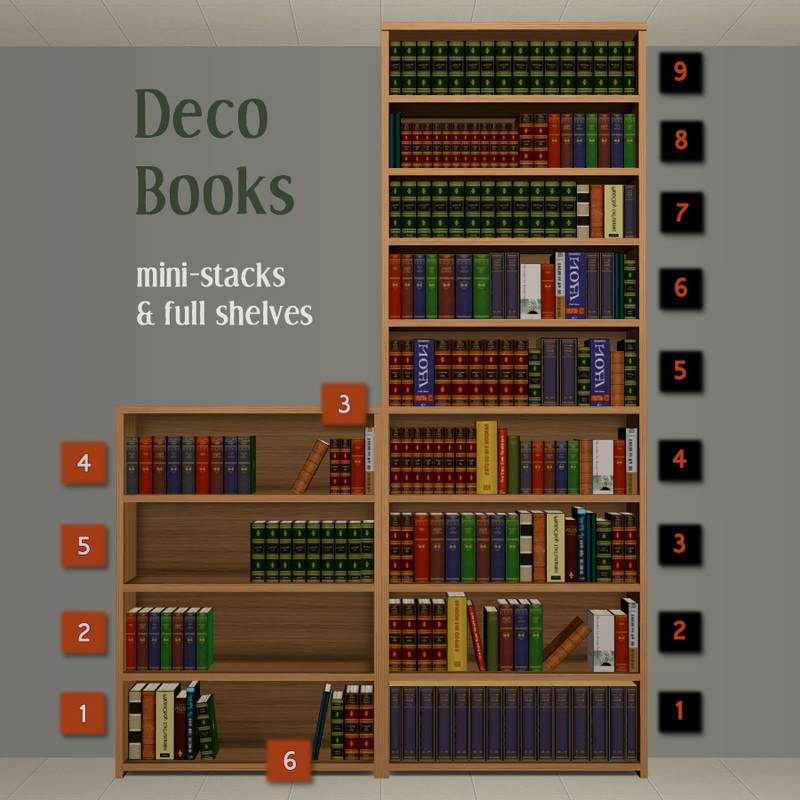 The books are purely decorative and have NO bookcase functions - there are two "types" of books - the fullshelves on the right of the picture (numbered 1 to 9) and the mini-stacks on the left (numbered 1 to 6). These books are placeable pretty much everywhere that you can place a small deco object. I imagined that people might want to build book cases that went round corners so in the Dahlen extras file are some edge bits for the outer corners (like in the shot with the alien). The deco pieces will go over a door and the sim can still use the door - same for the edges - they are intersectable by objects and sims so there should be no routing issues. Usually I don't split uploads up like this - I hate having to download 50 million separate files instead of just one, so I hope you will forgive me for that, and here is the explanation of why I have done this. If you are looking to use a collection file and want to keep things in the catalog tidy then there are COLLECTION files and CATALOG FILES. The items in the collection files will NOT show in the game catalog but only in the collection file. The CATALOG files will show in the catalog. The Extras and bookstacks are just base - so there are only two options - collection or catalog. 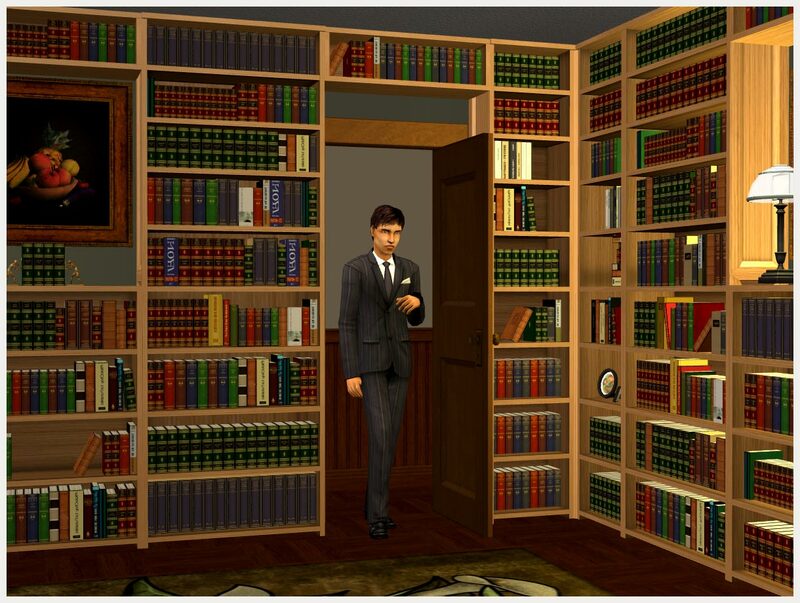 The dahlen bookcase is a university item, but it is partly slaved to a basegame bookcase and uses a booktexture identical to the base game bookcase books. So - I made it basegame and slaved it to the Basegame Craftmeister Booknook. (GASP - now you now why I called it move over dahlen .) 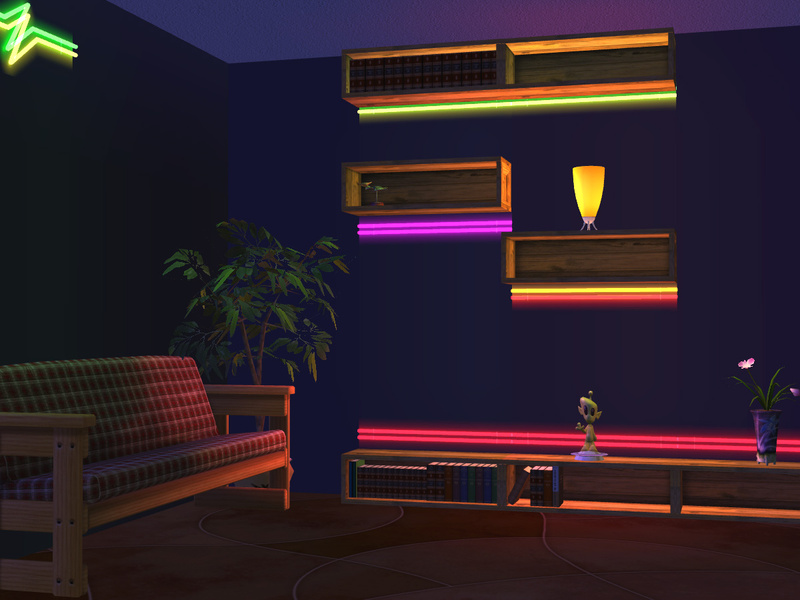 However, as of FreeTime the functions of bookcases were expanded by EA and so in this upload there are BASEGAME (BG) and FreeTime and above (FT) files, split into CATALOG and COLLECTION. I used the same GUIDS for all variations, so you can only have one set. Don't forget to get the COLLECTION FILE - it has a custom icon of a blue leefish on a bright yellow background. Place the collection file in your downloads folder. To make it totally flexible on the flat cases each shelf has three slots. One on the left, one in the middle, one on the right. a full stack will fill a WHOLE shelf (so you put them in the middle slot). If you put them on the outer edges they will stick out - I did it deliberately with some - it can look quite nice. On the corners there are 4 slots per level - 2 per shelf. The ministacks 5 and 6 fill the shelf, the other ministacks (1 -4) are for either right or left. Most of them fit fine. You can't really use the long pieces on the corners. 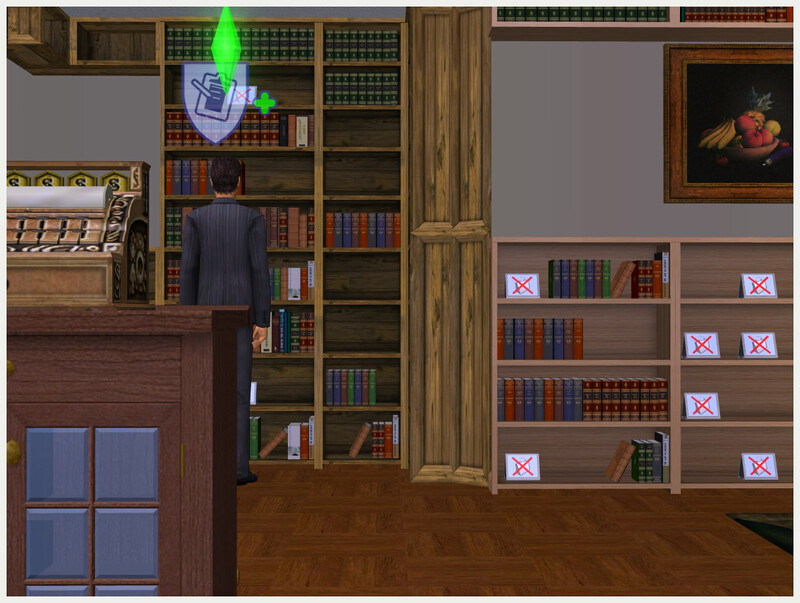 The over the door bit is fully intersectable by objects and sims, but unfortunately I cannot guarantee that the objects you place in the slots are also fully intersectable. Following a tip from MSD I made a table thing that you can place an object on and pick up and put down - and pow - intersectable object. Then staying in buymode place it on the shelf you use over the door. The object will be intersectable and you can use the door properly with it opening and closing. Henry's suit by fanseelamb, paintings by Plasticbox. Move over Dahlen Collection File.rar | Description: The collection File. You need this if you download the collection only files. leefish+max-intersectiontransformer.rar | Description: Use this to make objects that you place in the over the door bit intersectable so that the door will close.